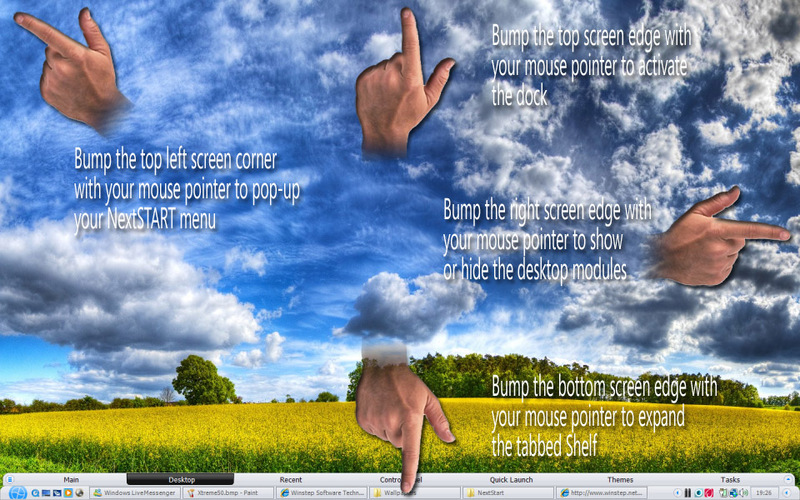 Lets you have a desktop that becomes the envy of whoever looks at it... everybody loves a pretty face! Download Winstep Xtreme now and try this powerful suite of Windows desktop enhancements for 30 days. 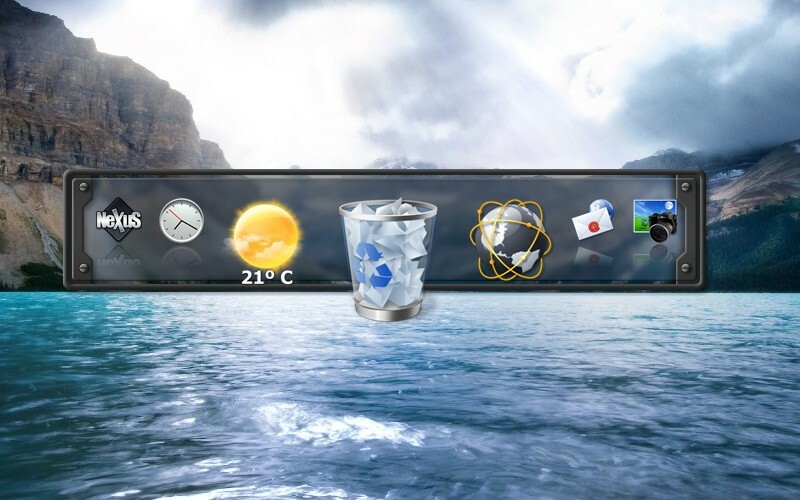 Purchase Winstep Xtreme today and receive a BONUS pack of over 1,000 beautiful dock tile bitmaps! Nexus is the dock system, and is just perfect for super fast access to your most used applications. You can have as many docks as you want, and each can have multiple sub-docks and Grid Stacks! When not in use, docks can hide behind your screen edges, taking virtually no screen space. Workshelf adds tabbed docks (Shelves) and Drawers, better suited to complex organizational duties like organizing documents, URLs, movies, work projects, etc... If a dock is the top of your desk, then Workshelf is all the drawers below it. Shelves and Drawers make it possible to have a 'clean' desktop with no icons on it whatsoever by hiding icons on the Desktop - icons that can then be quickly accessed via a Shelf's Desktop tab. NextSTART is the menu system - and takes care of all your task management needs as well. 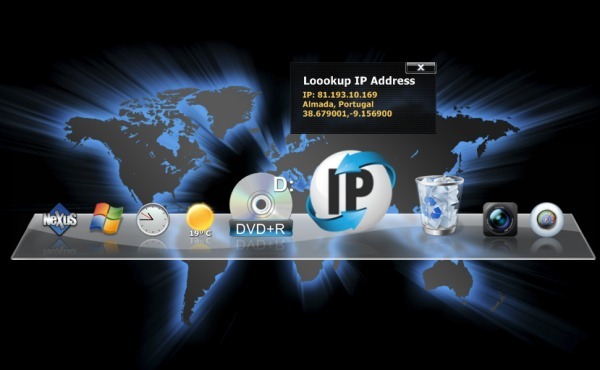 Menus are great for accessing infrequently used files and system related commands that aren't easily reachable in the file system or that have no readily user-recognizable graphic representation. The task management part of NextSTART allows you to efficiently organize and manipulate running tasks and windows. 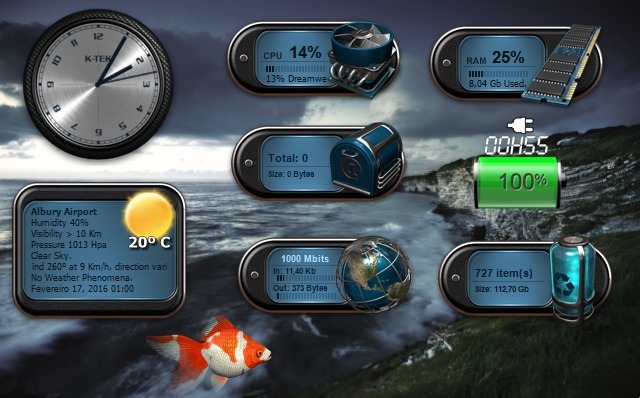 Winstep Xtreme includes a speaking Clock, Recycle Bin, Battery Monitor, Calendar, Email Checker, Moon Phases, Weather Monitor, CPU, Net and RAM Meters and the amazing Wanda fish. 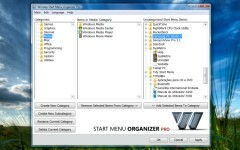 The Winstep Start Menu Organizer is an application designed to help you organize and clean your Windows Start Menu. Over time the Start Menu can get so cluttered that you end up spending a lot of time simply trying to find the program you want to run. The Start Menu Organizer allows you to quickly group your Start Menu shortcuts into a specific set of categories thus making finding what you are looking for much, much, faster! NextSTART, Workshelf and Nexus Ultimate are far more than just loosely related applications - they were designed from the ground up to integrate seamlessly with each other: change the current theme in one and all other applications in the suite will automatically change to match, Workshelf and Nexus use the current NextSTART theme to skin their context menus, NextSTART created menus can be launched from docks or from the Shelf, WorkShelf docks and Grid Stacks can be open or activated from NextSTART and more! 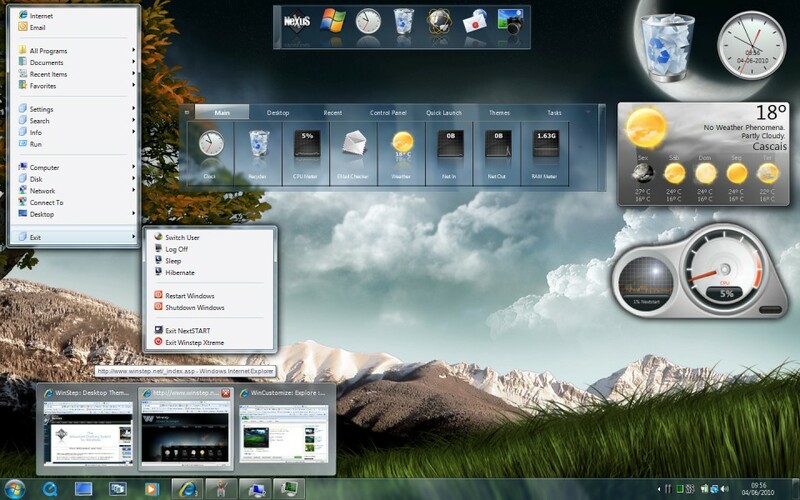 NextSTART's menu system can emulate the look and feel of menus in other Operating Systems with ease. It can also build menus 'on-the-fly' displaying the contents of folders in your hard drive - this, together with NextSTART's unique ability to display document thumbnails side-by-side with the menus, makes it a breeze to browse your entire folder structure and quickly find what you are looking for. Thanks to an incredibly flexible feature utilizing user defined Hotspots, you can "attach" menus to not only different areas of your desktop but also other applications! Activate your menus using different mouse buttons, screen edge 'bumps', keyboard shortcuts and even special hotspot 'buttons' on the desktop. 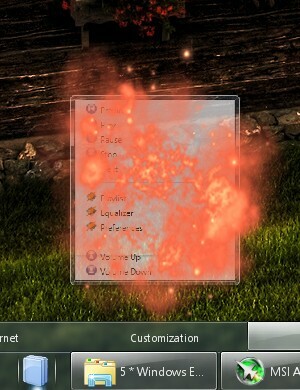 Hotspot actions are not limited to displaying menus. You can also use them to launch programs, open web sites on your browser, and even execute one of the 80+ useful internal commands and Windows functions. You can conveniently open and activate WorkShelf docks and Grid Stacks from icons in the Quick Launch area of the NextSTART taskbar, from NextSTART hotspots and even from NextSTART menus. You decide what to use and what not. If you prefer to use the Windows native taskbar instead of NextSTART's superior replacement, you can simply disable NextSTART's task management - this doesn't prevent you from continuing to enjoy the use of NextSTART's powerful user-defined menus and flexible program launching abilities. If you have no need for a tabbed Shelf or a dock, you can disable them too - same for Desktop Modules, hand pick the ones which are useful to you and close the others. Create multiple docks for a variety of customized needs, organize applications within collapsible groups, or 'sub-docks'. 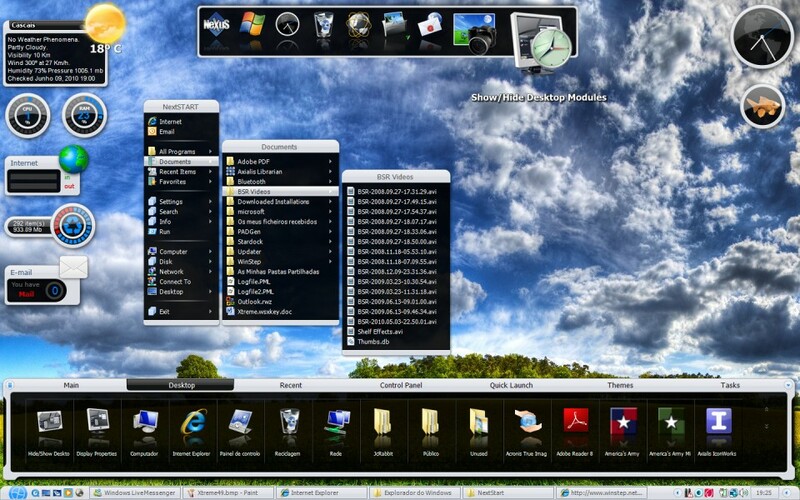 Not only being able to hold shortcuts dragged into it, a Shelf is also capable of displaying the contents of special shell folders such as the Desktop, My Computer, Control Panel, Recent Documents, and so forth... It's even able to display the contents of folders in your hard drive, which can then be manipulated via drag & drop as usual. 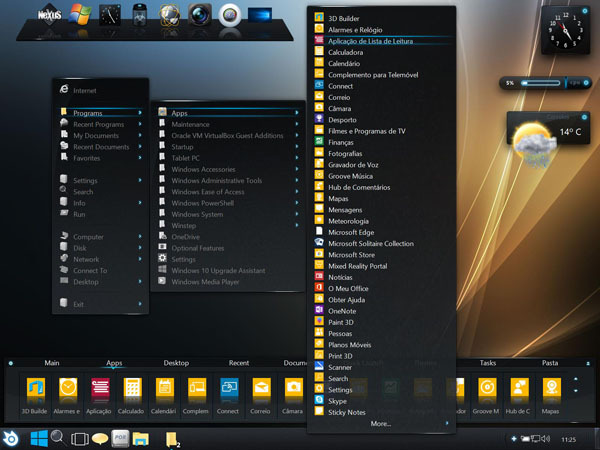 A Shelf makes it possible to have a 'clean', uncluttered, desktop with no icons on it whatsoever by having Winstep Xtreme hide the icons on the Desktop - icons that can then be quickly accessed via the Desktop tab. Tabs in a Shelf can also have keyboard shortcuts associated to them to make the Shelf simultaneously come to the foreground and open that particular tab. Create docks from existing Shelf tabs, create Shelf tabs from existing docks, detach sub-docks, turn docks into sub-docks, duplicate docks, delete docks - all this using simple drag & drop and/or context menu options. Stacks are a particulary useful new feature that can give you instant access to the contents of Applications, Documents, Downloads, and any other folders placed into a dock, shelf or drawer. There they’ll then sit until you click on them, at which point they’ll spring out in a grid arrangement. Basically a single tabbed Shelf, a Drawer is a dock/shelf hybrid, merging some of the best features of docks with some of the best features of shelves. Shelves, Drawers and Grid Stacks are able to display folders containing thousands of files - so sometimes finding what you want is the problem. All you need to do is start typing, and contents are automatically filtered according to what you just typed. You can press Backspace to delete a character or ESC to clear and dismiss the search filter. 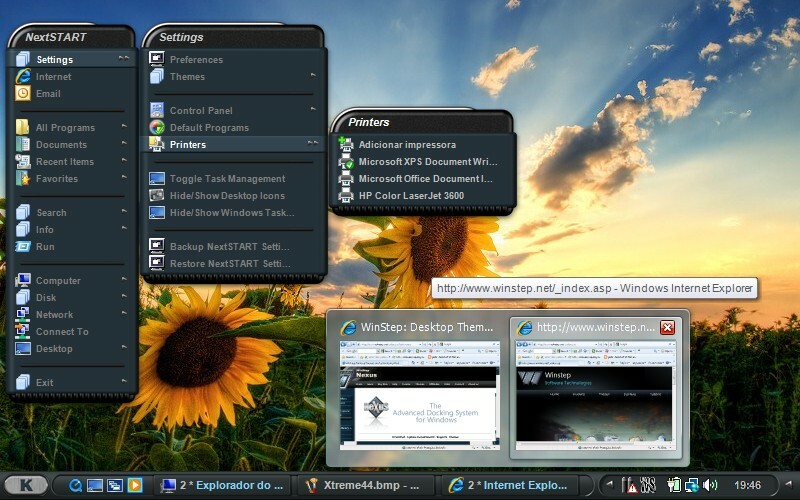 Everything in Winstep Xtreme was designed to use as little screen space as possible when not in use: off-screen menus can be invoked by bumping a screen edge or corner with your mouse pointer, docks can be hidden off-screen until needed, the tabbed Shelf can automatically collapse so only the tabs remain visible, Desktop Modules can be hidden until invoked by a keyboard shortcut or other activation method, and even floating docks can be collapsed to a single control icon. 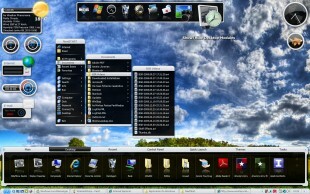 Besides shortcuts dragged into it, a tabbed Shelf is also capable of displaying the contents of special shell folders such as the Desktop, My Computer, Control Panel, Recent Documents, and so forth... It's even able to display the contents of selected folders in your hard drive, which can then be manipulated via drag & drop as usual. 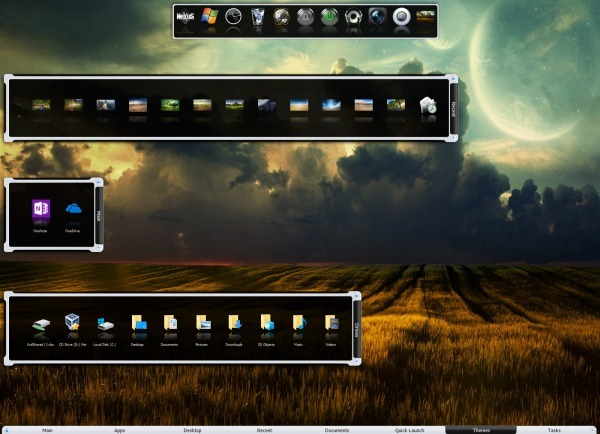 A Shelf makes it possible to have a 'clean', uncluttered, desktop with no icons on it whatsoever by telling Winstep Xtreme to hide the icons on the Desktop - icons that can then be quickly accessed via the Desktop tab. Tabs in a Shelf can also have keyboard shortcuts associated to them to quickly make the Shelf simultaneously come to the foreground and open that particular tab. Running applications and the systray can be placed ANYWHERE you want to, in the NextSTART taskbar, in docks, in Shelves, in Drawers, hidden in Grid Stacks - you choose! System tray icons are originally small 16x16 icons, and can look very blurry when displayed at larger sizes. 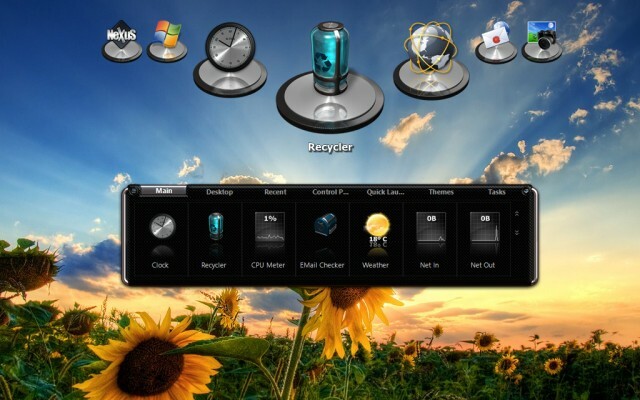 Winstep Xtreme allows you to customize tray icons with high-resolution alternatives to solve this problem, with a set of high-resolution images for system tray icons being included in the application. Winstep applications are unique in their category because they're able to handle UWP apps in Windows 10 like normal Win32 applications. The first (and only) Windows dock to feature optional 'live' icon reflections: reflections update in real time if the source icon animates or changes. 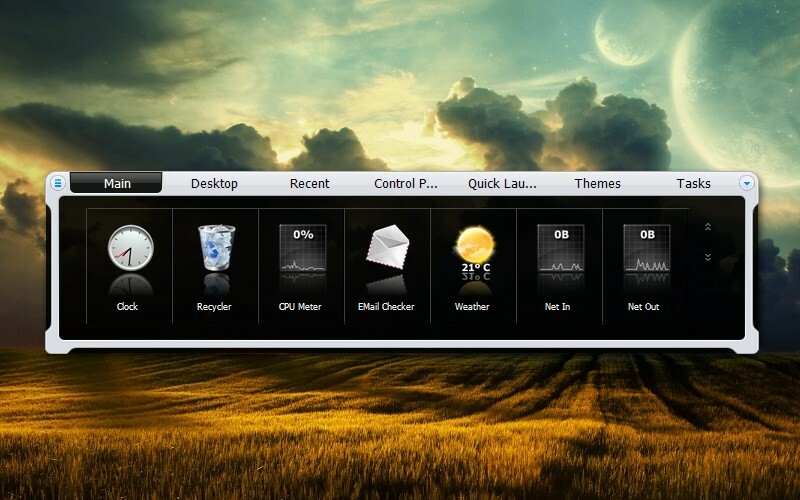 How much of the icon is reflected is also user configurable. Object based interface offers "drag & drop" capabilities that make it simple to manage your applications, files, printers, etc... Use Drag & Drop to move/copy/re-arrange objects from one location to another, to both inside and outside of docks. Drop documents onto dock application objects and have them automatically loaded. You can quickly change the images used by items simply by drag & dropping your favorite .ICO, .PNG or .TIF file onto the chosen object. Internal commands are special commands that you can add as shortcuts to docks, menus, NextSTART taskbar and the Shelf: Hibernate, Power Off Monitor, Empty Recycler, Show Start Menu, Language Bar, CD Control, Lookup IP address and over 80 more! Click here for a full list of Winstep's internal commands and what they do. Winstep Xtreme features various modules (widgets) such as a talking Digital/Analog Clock that synchronizes your time with time servers on the internet, a Battery Monitor, a Calendar displaying upcoming events schedules using the built-in Alarm Manager, a Recycler, an Email Checker that supports SSL and multiple email accounts, an animated Moon Calendar, a Weather Module, CPU, Net and RAM Meters and Wanda, a 'fortune cookie' animated fish! 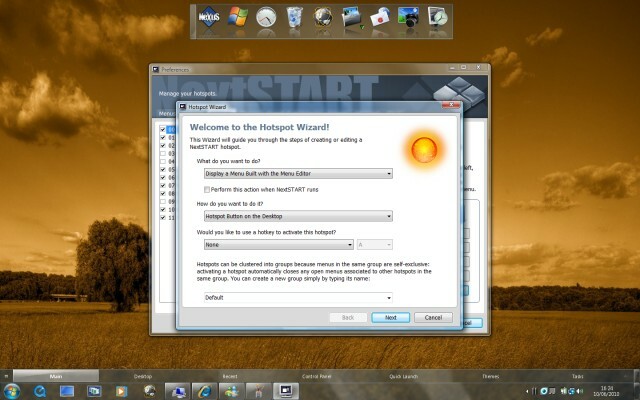 Click here for a full description of Winstep's modules/widgets and what they do. 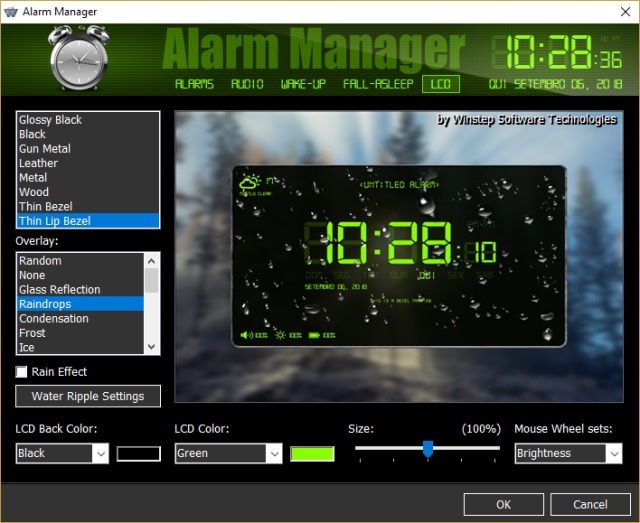 Powerful clock module associated alarms allow you to display pop-up reminders, wake you up with music or run programs at specific times, once or periodically. Lots of special effects such as icons zooming, bouncing, glowing, rocking, swinging, squishing, spinning, exploding, etc, on selection, shifting to make room for items about to be dropped, bouncing on application launch, visual feedback for specific actions, incredible 'fluid' effects that make docks and icons behave like liquid surfaces, menu opening animations, sound effects for specific events, and lots more! 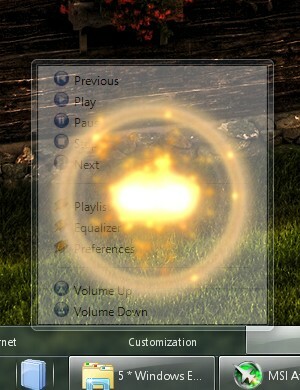 Winstep Xtreme features built-in support for animated icons. With no need to install 3rd party docklets and full drag and drop support, animated icons in Winstep applications are as easy to use as any other icons: drop the animated icon PNG strip directly into a dock or Shelf item and the icon will automatically start animating. The taskbar, docks, shelves and drawers can be docked to any screen edge or left floating on any monitor. Makes sure maximized windows do not overlap docks, shelves and drawers when attached to screen edges. You can even manually reserve screen space to prevent maximized windows from overlapping 3rd party toolbars and widgets that to not offer this handy feature. 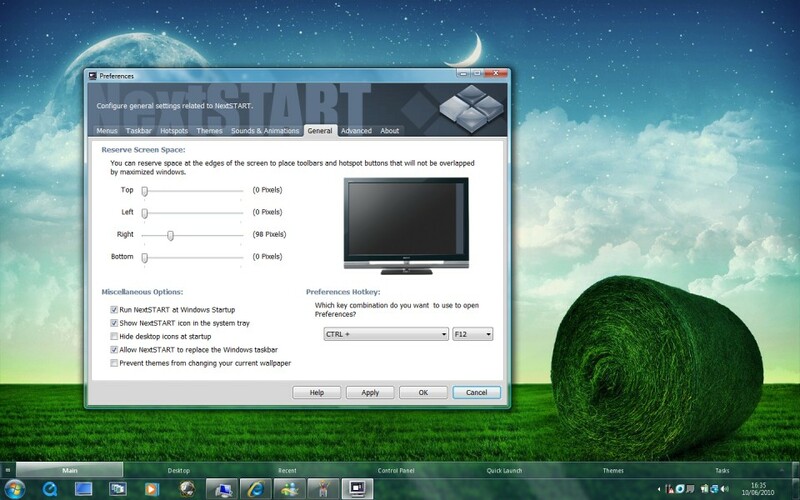 Makes sure that docks, shelves and drawers do not overlap other items such as the taskbar and other docked Windows toolbars. Full keyboard support makes docks in Winstep Xtreme ideal for Home Theater users: Winstep Xtreme docks are the first - and only - Windows docks that can be fully controled with nothing but the keyboard and remote controllers such as the Logitech Harmony. 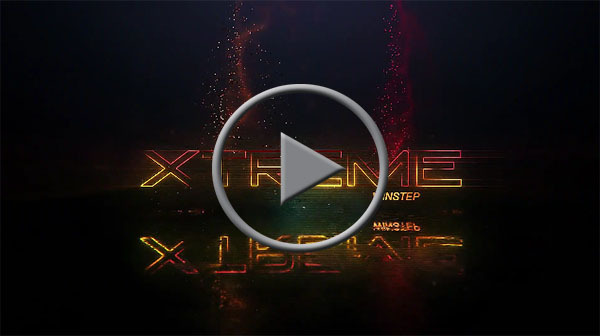 Virtually every aspect of Winstep Xtreme is customizable: from looks to behavior. 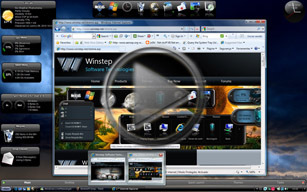 Winstep Xtreme has undergone extensive testing by thousands of dedicated users. This testing continues as part of our ongoing efforts to provide top quality software to our customers.